Historically there’s always been a robust fight against the free spread of information that is accessible to the masses. Given that a journalist’s only weapon is the pen, the scribes are a relatively easy target to harm. Over the past couple of years, the world has become a more dangerous place for journalists who have faced tighter constraints on the media. According to a report published by Freedom House, 2015 saw freedom of the press plummet to its weakest in 12 years. 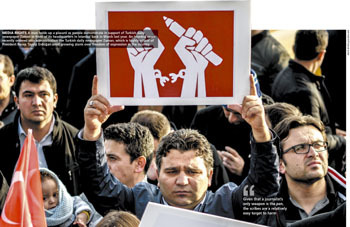 The report based its rankings on evidence which revealed that assaults on journalists have become widespread especially in the Middle East, North Africa, South Asia and Latin America. In its report ranking 199 countries, where the lower the score the freer the media, the global average was 48.9 – the worst since 2003 when it was 45.5. Some of the worst-ranking nations include Turkey, Bangladesh, Burundi, France, Serbia, Yemen, Egypt, Macedonia, Zimbabwe, Belarus, Crimea, Cuba, Equatorial Guinea, Eritrea, Iran, North Korea, Syria, Turkmenistan and Uzbekistan. And the reported repression was deadliest in the Middle East and North Africa. Considering such recent studies, freedom of the press is only prevalent in a few countries around the world. Governments worldwide – whether they are developed or developing nations – with the exception of Scandinavian countries have proved to be alike. “Media freedom declined not just in repressive societies but also in Europe,” Freedom House’s Director of Research for the Freedom of the Press report Jennifer Dunham says. In countries such as North Korea, Eritrea, Turkmenistan and Uzbekistan, governments exert strong control over media and information outlets. In these countries, the few journalists who dare to take the risk of passing information to the public put their lives and those of their families on the line. A similar scenario prevails in Djibouti where employees of the only independent news outlet are constantly hounded. Meanwhile in Equatorial Guinea, the publication of privately owned newspapers is dwindling rapidly. In Sudan, where arresting journalists and the seizure of newspapers – even those published by pro-government sources – is a frequent occurrence, a committee has been dedicated to reviewing all news content prior to publication. A similar committee has been established in Kazakhstan to vet the news in times of riots, strikes and major demonstrations. “While democracy is widespread in Latin America, news organisations faced increased threats both from criminal gangs and the authorities. In Mexico, journalists who sought to cover organised crime and corruption faced extreme levels of violence, and the government has proven completely unable or unwilling to address the problem,” Dunham notes. A sharp decline in the freedom of expression has seen the rankings of many countries drop, creating a dangerous environment for citizen journalists and netizens in the field of journalism. Shortly after establishing complete control of traditional media by repressive governments, dissemination through the internet increased, raising additional concerns. Governments that initially struggled in this new arena of virtual spheres are now becoming experts at controlling the traffic of information across online media outlets as well as different social media networks. Their ability to control online information was only made possible with the help of surveillance technology sold by leading Western companies. China has positioned itself as one of the pioneers of censoring online content. Pro-democracy movements in Hong Kong have been the target of skilfully orchestrated information blackouts as well as blocking search engines and microblogging sites, and all Google services to around 90 percent. In Iran, the cyber police has access to messages exchanged on mobile apps – and arrests have been made in connection with messages sent on WhatsApp, Viber and Tango. Internet access remains largely limited, on top of it being prohibitively costly. Unfortunately, blocking websites without a court order is still being widely practised. Meanwhile, criminal restrictions continue to keep bloggers in check. In countries like Saudi Arabia and Bahrain, cybercrime charges are often used to justify long jail sentences. Nevertheless, it must be noted that despite all the dangers that journalists and netizens face, the presence of the internet has created a situation whereby no amount of censorship can silence the media. Today, ordinary citizens are considered well-informed compared to any other time in history.